The Hindu community celebrated the Diwali Festival (the festival of light) with religious fervour, traditional zeal and enthusiasm on Wednesday. 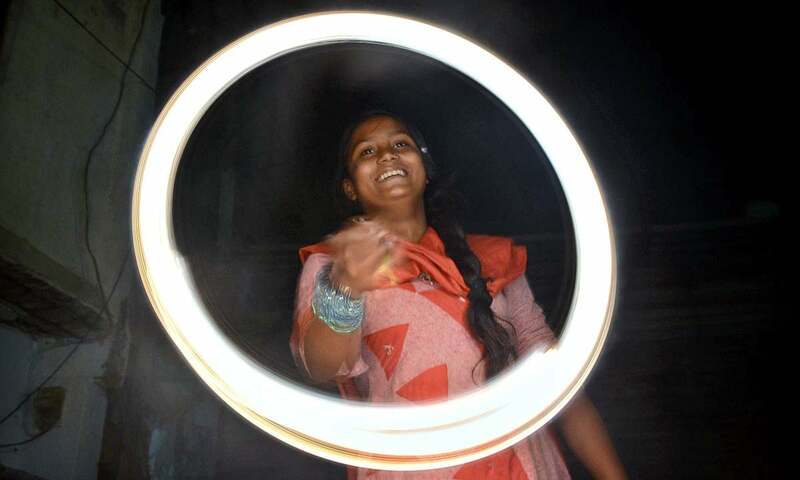 People across the country illuminated their worship places on the eve of Diwali Festival. 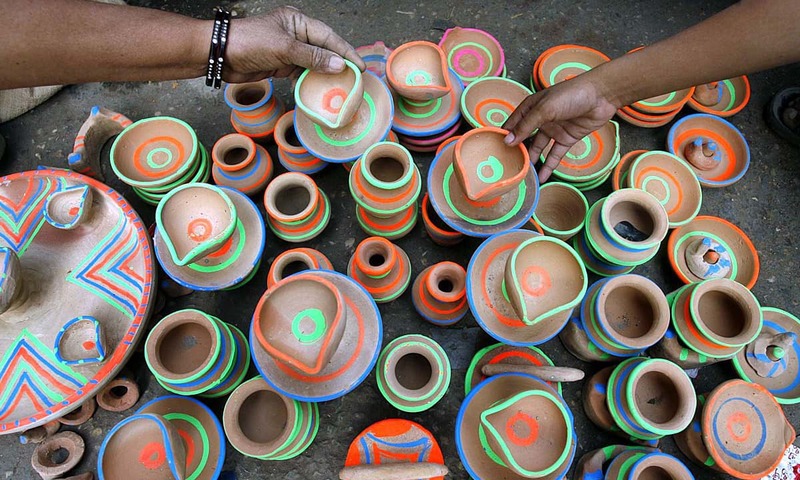 Diwali is a colourful festival involving lighting candles, worship, celebrations and prayers. Twenty-one days after Dussehra comes the most awaited festival among Hindus, “Diwali”, celebrated to mark the day when Lord Rama returned home after his 14-year exile. It is a five-day Hindu festival and during this time, houses are cleaned and windows are opened to welcome Lakshmi, goddess of wealth. Candles and lamps are lit in and outside every home as a greeting to Lakshmi. All celebrations end at daybreak, the people then visit friends, relatives and exchange sweets and gifts. Special ceremonies were held by local Hindu community in connection with the festival. The local Hindu leaders cut the Diwali cake and distributed gifts and sweets. The Pandits and devotees held prayers in different temples for integrity, solidarity and security of the country. Meanwhile, the police had made tight security arrangements in and around the Hindu temples to avert any untoward incident. Wish you all Happy Diwali!!!! Diwali wishes to all pakistani hindus. A very happy diwali to my Pakistani Hindu brothers and sister! May this be the year of prosperity for you. Deepawli the Festive of Light, Light for Knowledge, Values of Sacrifices,evil over and Truthfulness wining, Welcome of New crop at Home, winter koncking and last but work huge cracker all around with noise smoke and garbage around. wish you all pakistan people "HAPPY DIWALI"
Actually, Diwali is older than Lord Rama. It began to be celebrated as a Day when weather changed in North India. Night arrives early. Divas were lighted not only as a celebration but also to indicate to a traveller that a village was not far. It is said that Lord Rama waited for two days outside his Kingdom's capital to enter the Capital on the auspicious day of Deepavali (now called Diwali). For businessmen it also used to be day when new financial year begins (hence, Lakshmi, the goddess of wealth). Happy Diwali to all our Hindu Brothers & Sisters, Elders and all...!! Happy diwali to all our Pakistani Hindu brothers and sisters. I wish all Hindu families in Pakistan, India, and in other countries a very happy Diwali. I wish them peace, love and health. Thank you Dawn for these beautiful photos and report. Happy Diwali all Hindus where ever they are. Very Nice article DAWN. This is one of my favourite publications. Keep up the good work. Happy Diwali! They are actually celebrating the defeat of Modi in Bihar with firecrackers. Happy Diwali to all our Hindu friends across the globe in particular Indian-Subcontinent. May we we all live in peace and harmony, Ameen. Happy Diwali to all Hindus in Pakistan and India. All communities across Pakistan should join their fellow Hindu countrymen to celebrate Diwali and pray for peace, and amity in Pakistan. 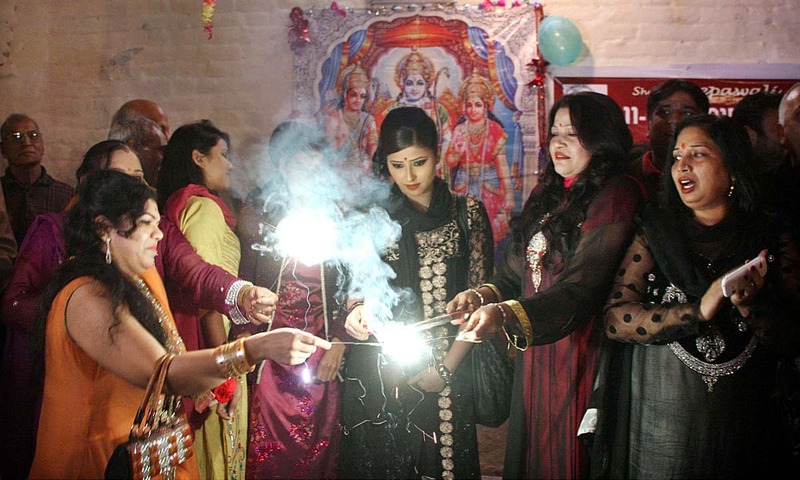 Happy Diwali, I am happy to see pictures of Hindu families celebrating this festival in Pakistan. I hope culture of peace and tolerance will grow between two countries. Happy Deepavali or Diwali, a festival of light. My greetings to all Hindus, Muslims and Sikh brothers and sisters of Pakistan. May god bless humanity on earth. Happy Dipawali to all Pakistani! Happy Diwali to all Hindu Pakistani brothers. Happy Diwali to all those celebrating! Diwali is about cleanliness of everything. It symbolizes victory of virtue over vice, good over evil, light over darkness, knowledge over ignorance, hope over despair etc. It is a very humane and natural festival of wishing and celebrating progress. Happy Diwali to all, irrespective of any divisive consideration because, it celebrates every goodness. Happy Diwali to Hindu/Sikh brothers and sisters. May this Diwali bring security, prosperity and happiness to everyone in Pakistan. Hindu extremism in India Vs Diwali celebrations in Pakistan. Difference you could see by yourself. Thank you mr Muhammad Ali Jinnah, the quaid e Azam. Happy diwali to all hindus across pakistan. This is more like Jinnah's Pakistan...Happy Diwali to Hindus in Pakistan and India and to everyone, let's shares the blessings of Diwali. Rama is the lord of virtue for women and self control for men. It is a must for women and holymen to celebrate the day. 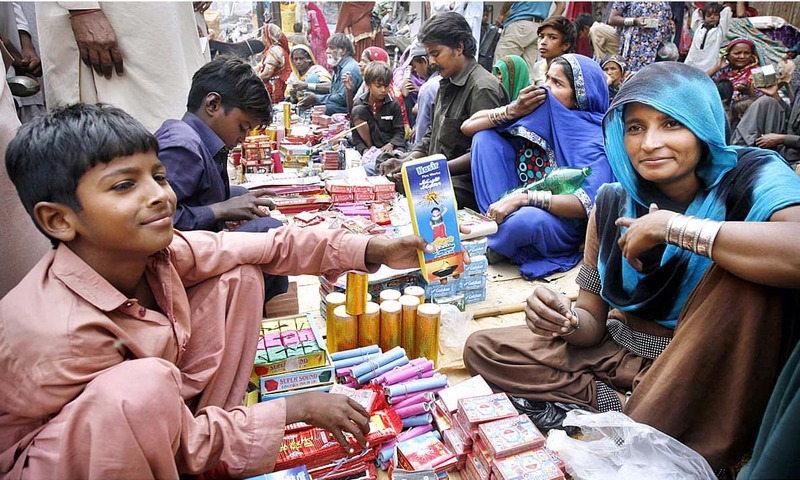 Firecrackers banned in Karachi, no holiday announced for Hindu children in schools by Sindh Education Department like last year in 2014 it was officially announced. We are getting firecrackers with lots of hassle on double rate at Sea Breeze Hospital opposite Capri Cinema anyways but I appreciate PM Nawaz Sharif who for the first time in the history of Pakistan, if I remember, any Prime Minister thought of the Hindu Community to wish them through Media as well as personally participating to celebrate Diwali with the Community. It is better later than never and this tradition should be followed in future too because Hindus living in Pakistan are first Pakistanis and then Hindu. Long live Pakistan Long live Nawaz Sharif. The spirit of brotherhood witnessed in Pakistan is heartening for all of us here in India. A prosperous and secure future for our coming generations is possible only in a spirit of cordiality amongst various communities and countries in the subcontinenr. Wishing a happy Diwali to oall our brothers and sisters - Hindus, Muslims, Sikhs, Christians, Parsees in Pakistan. May peace and prosperity prevail for all. Happy Diwali to all Hindu friends. I wish Indian leaders would promise on this day of lights that they would not push their country to darkness of hatred and ignorance anymore. Happy Diwali to all Hindus!!!! I hope this year changes the relationship between Pakistan and India for the better. 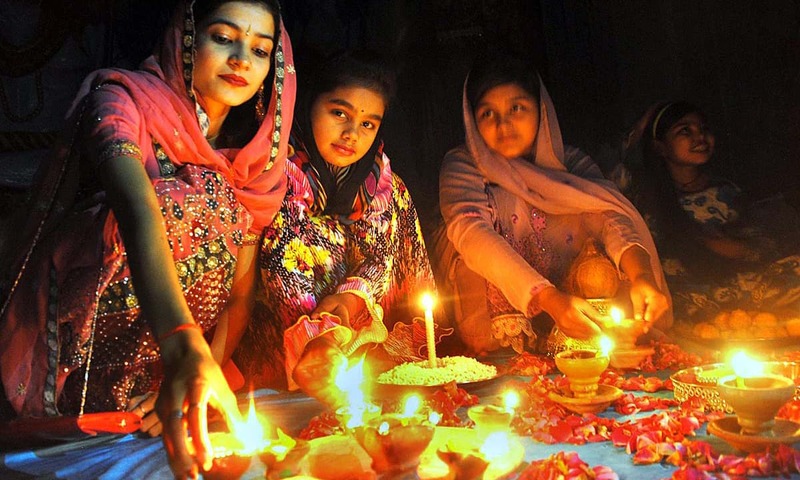 HAPPY DEWALI to all Hindus living in Pakistan and India. @Parmesh Kumar Marker I appreciate your thoughts and sentiments. You are our brethren and an integral part of our society and country. We hold you in esteem and assure you share your sorrows , God forbid if any for ever. we also wish you gaiety and mirth in your life. @Lakhkar Khan It is these small message of hope and good will by people which will and can change the destinies of both nations to make happy and prosperous.unfortunately at every step we invoke Kashmir and spoil the taste and atmosphere and go back to our roots of suspicion. happy diwali to all in pak.!! 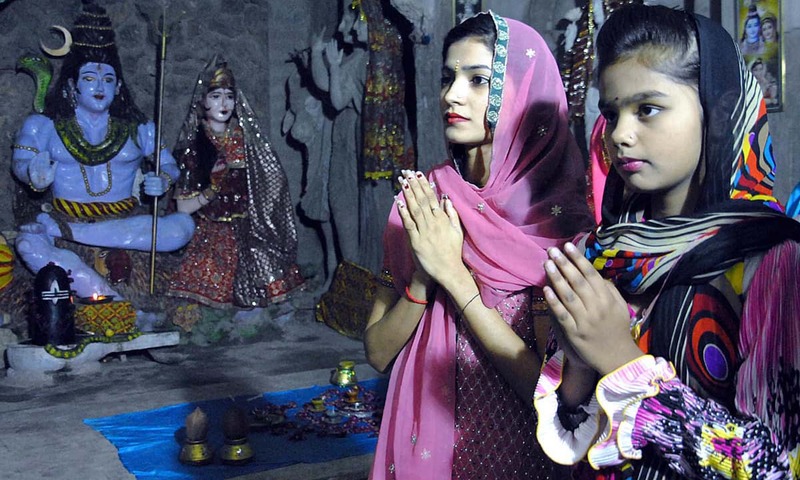 Hindus of all castes are better off in Pakistan than in India. They consider themselves luckier than others. Happy Diwali to all Pakistani Hindus. Happy Diwali to all Pakistanis ! God bless you ALL. Great to see our Hindu brothers/sisters celebrate the colorful festival of Diwali... I wish and pray religious tolerance for all of Pakistanis and Muslims around the world. Pakistan is the land of Sufis; the land of peace; the land of poetry... unfortunately, extremism was imported into Pakistan from the Saudis. Let's reclaim our true identify and embrace the love and compassion of Prophet Muhammad (PBUH). Happy Diwali to all Hindus in Pakistan.May Goddess Lakshmi grant peace,prosperity and security to all Hindus in Pakistan!It will be a good picture of unity if Muslims join Hindus in this celebration as Hindus do in celebration of Eid. See the difference between India and Pakistan today, See how Peaceful is Pakistan today. Respect begets Respect. Be unite and live with us. Happy Diwali dear friends in Pakistan. And great report by the Dawn. Needs to be highly appreciated indeed!! Happy Diwali to all Pakistani Hindus. Live long and prosper!!! Dawn! I salute you from Canada for bringing so much happiness in my life. I believe in pluralism an love for all mankind be it Hindu, Muslims or Christians and all other faiths. I feel unthinkable sorrow when people of one belief kill other people of belief for no reason. After all one is born in one belief and it is not its fault. All the best and wish you all Love and Peace beyond boundry, religion, cast and creed. Happy Diwali to all our country men, women and children who believe in it. Good Luck. I am really happy to see all of you. @Zak Please read all the comments on this board and then your comment. It will show you while everybody is wishing happy Diwali and your comment is the only one that is politically motivated. That is why they say "some people never change"
@Philosopher (from Japan) You can see pictures of how Eid is celebrated in India every year. Happy Diwali to our co religionists in Pakistan. The dalits in pakistan look happier than the Dalits in India and have more opportunities. That I think is because in pakistan, they are not called Dalits or Brahmins but just another pakistani human being. The more I read a Dawn and learn about Pakistan, the more I am get impressed with this nation. Wish happy Diwali to all Hindu brothers and sisters. Diwali, Baisakhi, Basant are joyous memories of our ancestors' culture and traditions in us, non-Hindus. In the name of my ancestors and myself, I wish Happy Diwali to all Desis around the world. Happy diwali to all Pakistan from your Baloch borthers. happy to see people are celebrating Diwali! Happy Diwali to all Hindus around the world. Thank you DAWN for showing our Hindu sisters & brothers celebrating Diwali. Happy Diwali to all of you. Unity is strength Attraction rather than promotion. Thanks Dawn! 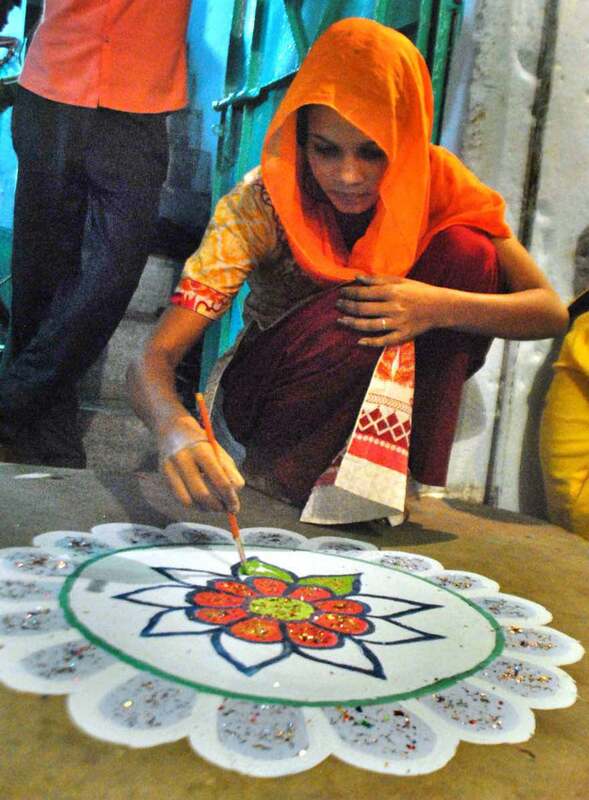 Thank you DAWN for these beautiful photos of Diwali. Happy Diwali and Prosperous Diwali to all. May there be peace everywhere. Fire crackers were used in olden time during Diwali to get rid of insects which used to appear in millions during this period of the year. Crackers used to kill these insects and save the crops from their invasion. Diwali crackers are a major cause of pollution and injuries and we need to curb cracker bursting now as it contributes to pollution and global warming as billions are burnt up in the air every year. Happy Deepavali to everyone everywhere! Happy Diwali to all my indians friends. Happy Diwali to all Indians and Pakistanis! Happy Diwali to my Pakistani Hindu brothers and sisters. @M.Saeed Ditto to everything that you said so beautifully.It's about time we leave animosities behind. We are all of one origin. Indian Government must give Frequent visits Visa to Pakistani Hindus. @Zak Can we hold such comments just for today,for God's sake? It sounds so much against the sentiment being shown by all brothers. Just chill,dear. Happy Diwali to all who are celebrating, be it Pakistan, India or wherever you may be! I think over the past 3-5 years, Pakistanis have become much more open-minded regarding Hindus. 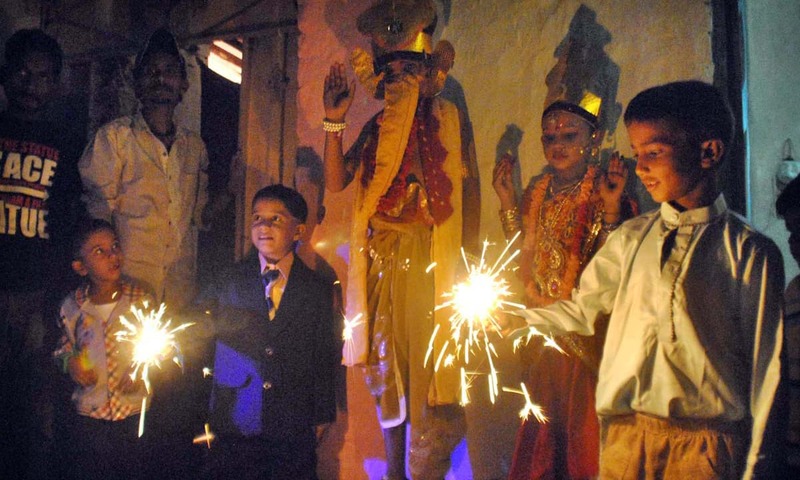 Diwali was something we never spoke about until recently. We didn't even care about the temples here. Now every year Diwali celebrations become bigger and more mainstream, and we are starting to take notice of the beautiful Hindu Temples we still have that need conservation. To all my Indian friends who think Pakistan is becoming more intolerant, I am happy to report that you are wrong. Happy Diwali to all my Pakistani hindu brothers! Happy Deepavali from Australia.For a few years now, the Opera house was fully illuminated for the few days of Deepavali and there were fire works and Indian dinner cruises.More and more people though they don't know the full significance, celebrate it as a festival of light.Thank you Australian Govt.Still miss the vibrancy of India and the celebration there. Thanks for the beautiful pictures. Happy Diwali to all on both sides of the border. Happy diwali fellow pakistanis. love you all. Thanks for the pictures. Irrespective of the religion it is always nice to see festive mood and happy faces!!! Happy Deepavali!!! Happy Deepwali to all my freinds, specially Sunder Chugani, and all in Mirpurkhas. All the best. Happy Deepwali to all my freinds specialy Sunder Chugani and Kamal Thadani. All my freinds in Mirpurkhas. Bless U all in Pakistan. Happy divali to hindu brothers and sisters. I am glad Hindus are allowed to celebrate Diwali in Pakistan. @ramu Of course! Always. Not only Hindus but people from all faith are free to celebrate their festivals. They have been celebrating with their free will since their existence in sub continent, Pakistan. A very happy Diwali to my Pakistani hindu brethren as well as hindus in rest of the world. Happy Diwali all brother and sisters.. We are with you.. Thanks to Pakistan police for taking steps to provide security. Wish Pakistan society will be as tolerant as Indian. After all we are all the same. Happy Diwali to all in pakistan !! Happy Diwali to all Hindus ! @Khan Sincerely hope and pray your words are true. Happy Diwali to all my friends in the indian sub continent. Words are too inadequate to express my thanks to Dawn for publishing consistently covering all important festivals of Hindus and its consistency in promoting harmony between both communities.This is how media can be helpful for bridging the gap of both community. Diwali is a festival which is inherently in everybody's genes. Everybody likes LIGHT, HAPPINESS, CELEBRATIONS, MERRIMENT in life. Truly,it is a global festival instantly touching heart of everyone. This is great gift of INDIA (Pakistan included) to the WORLD. My good wishes to all Hindus in Pakistan. May you enjoy all freedoms being enjoyed by majority of Pakistanis. Happy Diwali. It is refreshing to see that people are able celebrate their religious festivities in their ancestral homeland without molestation. @Ayaz Ahmed Khan: AYAZ your comments are very moving and uplifting the spirit. If many other Muslims are like you, all the problems of Indian Subcontinent will disappear immediately and we will be the strongest -not the second, but the top- in the world as the old Indian civilization and progress was unmatched by any other. You are guide for many others. 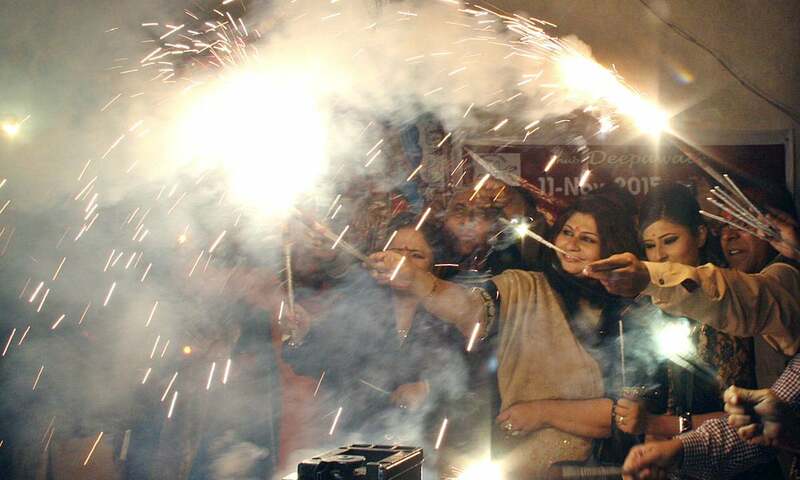 It is good Hindus can celebrate Diwali in Pakistan. @Muhammad : Diwali is not just for Hindus, It is for ALL Humanity for the motive of Diwali is enlightenment, goodness over evil. With enlightenment and goodness in thinking and in actions automatically brings peace, progress and prosperity, that is the essence of Diwali ! @Muhammad Your great comments are in are matching with you great name. Thank you. @Farhan T. It is pleasant to hear good words about what you see in picture and your comments. Being an open minded person we welcome you to be part of our real functions and gatherings in temples or elsewhere. You are welcome to join us. It pleases me More when i see Minorities in Pakistan Celebrating Their Festivals With Wider Smiles on their Faces. Happy Deepawali My Fellow Humans. Happy Diwali to all my Hundu brothers!! Happy diwali to all my friends in pakistan. Thank you DAWN for publishing such a beautiful article. @Parmesh Kumar Marker , Appreciate your comment about first being a Pakistani then a Hindu, this is how it should be , first your country then your religion, I hope all would agree. May goddess Laxmi fulfill your entire expectations on the propitious ocassion of DEEPAWALI-2015. Haapy Deepawali to You All. Wish a very happy and prosperous Diwali to all my Hindu brothers!! Thanks Dawn....!!! Be positive.....!!!! Happy Diwali and Happy New year to all ppl Especially Hindu living in Pakistan....!!! @Khan Bhai, you are right. I had a similar notion about Pakistan, but thanks to DAWN and government, it is changing now! I wish the happiest and most prosperous Dewali to all the Hindus in the whole world. Happy Diwali to all who celebrate it. I am dissapointed to see People here wishing Hindu only (Pakistan or India) .. whats wrong with you guys... Can not we wish in a better way ...How about HAPPY DIWALI TO ALL MY INDIAN AND PAKISTANI BROTHERS AND SISTERS... Nation comes first before any religion !! Happy Diwali...............to all, and love you Dwan! Happy Diwali to all. It is a joyous moment to cherish. Happy Diwali to all Hidus across the world. @Khan I am happy too. Happiness is in inclusion and not seclusion. Happy Diwali to all brothers and sisters of Pakistan. May the year ahead fill you with joy, peace and prosperity! Great to see that Minorities have the freedom to practice their rights. Way to go Pakistan ! I am so happy to see that Pakistani Hindu's are celebrating diwali, and our Muslim friends are Wishing them. As an Indian feeling good. Not just India, there was a huge celebration in Lahore and Karachi. Pakistan has full religious freedom. Really really. Pakistan zindabad. its nice to read that Police force was deployed near temple to avoid any incident. we should also make environment of tolerance so that common people also do not pose threat to them. Best wishes to my Hindu brothers and sisters have a great diwali day.